Time had slipped away as it alwaysw seems to on such days --- niggling gremlins versus inventive mechanics --- so there was absolutely no way that the agitated man with the flag was going to stop him now. It was far too good an opportunity to pass up. This car had been conceived and built for this track. That was the theory; this was its put-to-the test. 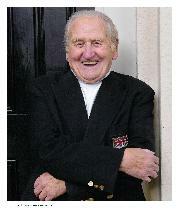 Tony Rolt, professional racer and former Colditz 'guest', kept his foot in for one extra lap. A proper one. His bare-metal car barked past the pits and swept around the long, fast right, chasing its future. Up the hill, under the Dunlop Bridge and down the other side, it gathered speed in a disarming fashion. The Esses were rushing up and he steadied progress on the middle pedal; its feel was unnervingly dead, its effect reassuringly powerful. The set-up was not yet perfect for heel-and-toe down-changes, but that was a problem for the near future. Indeed, there would be a swathe of detail changes on the subsequent jobsheet. 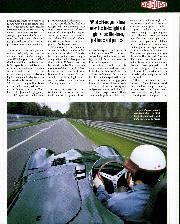 But right this minute, this lap, what mattered were the basics --- and whether Jaguar had got them right. Testing had been limited and the big race was only a month away. The rack and its pinion, stolid at slow speed, flicked left-blink-right. Smaller, lighter, lower, more manageable, it all felt good --- so far. The crux, however, was yet to come: the 3.5-mile Mulsanne Straight. A tidy exit from Tertre Rouge --- and it began: faster, faster, faster, faster, faster, faster. Inside his warm, enveloping cockpit, Rolt probably allowed himself a smile. His good old C of '53, its aeroscreen broken, had pummelled and buffeted him lap after lap, hour after hour; it was a good job that he and Duncan Hamilton were on their way to victory. This, in contrast, was first-class travel: safe, stable, swift. This time, the man with the flag was acknowledged. 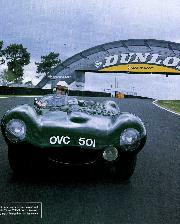 It's almost 50 years to the day since Jaguar was invited to gatecrash the Rallye de Sable Solesmes --- an event for which the Le Mans circuit was closed to provide a five-lap test --- as we roll the prototype D -type out of the back of an artic. Two kids gape from the rear seat of a Clio and their young mum clearly mouths, "Jaguar". True, we're parked just by Mulsanne Corner, where the old signalling pits used to be --- a corner of a foreign track that will be forever Jaguar --- but if you parked a D in front of the White House or in the middle of Red Square, people would stop and stare and would know: it's that sort of car, that sort of shape. It's much more than that, of course: its form was bent to fit its function. Despite the combined talents and tinkering of Bill Heynes and Harrys Munday and Weslake, the sculptural XK straight-six had, for the moment, plateau-ed at 250bhp. That vital extra speed would have to come from elsewhere. Step forward Malcolm Sayer. 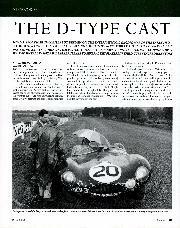 The company had rescinded the diktat that its racing cars should ape their road-car cousins, so this ex-Bristol Aircraft Corporation aerodynamicist, the man who had styled the C-type, was given a free rein with the D: he created a thoroughbred. The prototype was never fitted with that trademark aeroplane-meets-car headrest fin, but its flowing, shrinkwrapped form stunned the public on its debut --- and that's before it had grasped the complexities of its build. At the core of Sayer's masterpiece lies an elliptical-in-cross-section mag-alloy monocoque unit, to the back of which is bolted the rear suspension and axle. Ahead of it, and integral with it, are four tubular frames (two upper, two lower) that extend diagonally forward from alongside the driver's left hip, pass through the front bulkhead (to which it is welded) and connect to lower and upper front cross-members sited just behind the radiator. These tubes embrace the gearbox and engine, and are in turn stiffened by an A-frame that sprouts from the widest extremities of the monocoque and intersects at the centre of the upper front cross-member. This entire construction was argon-arc welded, which made it difficult to build and harder to repair --- a bolt on nickel-steel front section simplified matters in 1955 --- but it was incredibly stiff and devilishly clever. 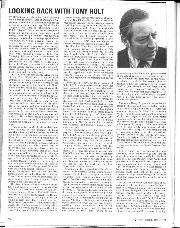 But money was tight at Jaguar, its thinking eminently pragmatic, and so the D raided its parts bin as well as its think tank. That 3.4 engine (albeit now dry-sumped and canted left at 8deg for a lower bonnet-line), disc brakes and entire four-trailing-link rear end (albeit now with a narrower Salisbury live back axle) was lifted straight from the 1953-spec C-type. The D-type was an odd blend of blue sky engineering and red pen accounting that could have gone horribly wrong but which Jaguar got spot-on. The key to this was that it knew precisely what it wanted from the D: Le Mans. And it got it: thrice. And this is the car that started it all: XKC 402, so new, so fresh that the D nomenclature had yet to be officially coined. Just walking around it chips away at my armour of cynicism to reveal the reluctant patriot beneath. To twist the key and thumb the starter of a D-type is to don Union Jack underpants, those sidepipes burbling an automotive of Elgar's Nimrod. Blip the throttle and they swing instantly into Jerusalem, with its mountains of British Racing Green. Give it some berries down a straight, open wide the throats of those three side-draft Webers and it's a packed house at Twickenham: passionate, intimidating, confident. The prototype never raced, but few cars have so elegantly stated their case on a track. 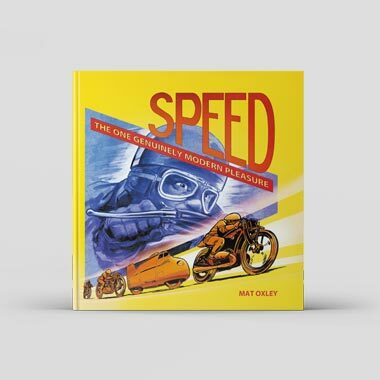 It first stretched its legs in April 1954 along the runways of RAF Gaydon, and then barrelled around MIRA's speedbowl — useful stuff, but not exactly where it was at. 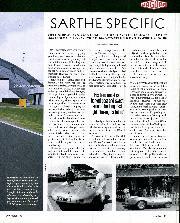 Le Mans was the be-all and end-all for the Coventry marque, hence its badgering for a test there in May. Mercedes had already pulled out of the race, its 300SLR not yet ready, and Lancia was making similar noises, so it was vital that the Automobile Club de l'Ouest looked after Jaguar's fledgling entry. The rally's organisers, therefore, were prevailed upon and a slot found. It wasn't exactly the best-laid plan to begin with — and then things went awry. Works driver Peter Walker was delayed after he forgot his passport, and an (almost) inaccessible clutch slave-cylinder failed; chief mechanic Phil Weaver performed a miracle in getting it fixed (just) in time. When Rolt went out, therefore, anxiety had replaced confidence. And so the lap he uncorked on Saturday May 8 was not him showboating, it was good husbandry. He stopped the clocks at 4min 22.2sec to smash the lap record, held by Alberto Ascari's monstrous 4.9-litre Ferrari, by 5.2sec. It was a coup de grace with pace. Brain had beaten brawn. The team went home with a spring in its step and returned one month later, now 42 strong, raring to go. The don't-slip-it triple-plate clutch is let out with a whisper of revs and the D breaks into a gentle roll with none of the spitting and hissing of its Italian brethren. What immediately strikes you is how easy this feels: light and tight. No scuttle-shake, just focus and purpose. Second gear is back and up via a lever that adopts a handbrake stance in the shadow of the body's blanked off 'passenger' aperture. 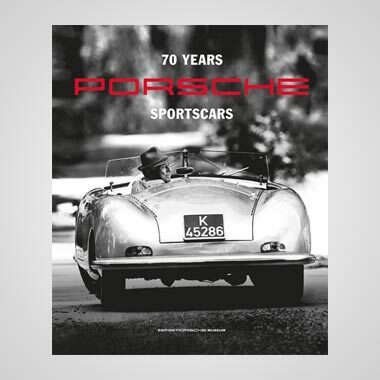 Then you lean into that comforting padded headrest, stretch out your arms, wriggle your leather gloves around that willowy steering wheel, peer out over a green and pleasant bonnet — and wind it on. The XK starts to pull from 2000pm — and really go from 4000. Third. Fourth. This is addictive. Night-and-day better than the C-types I've driven. And that's before I press the brake. I give the said item my usual self-preservation tap, not expecting very much. 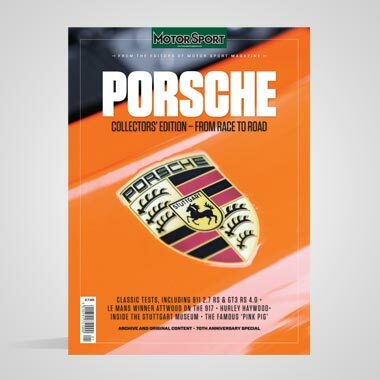 The pedal is solid, its touch light This combination — plus a tendency to lock-up the rears — did not endear itself to every period driver, but for a journo privileged to have a blat in an irreplaceable car, it's manna. The brakes are right there, with you all the way. They feel mid-1960s, not '50s. 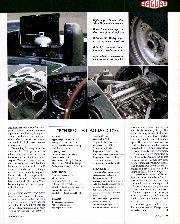 You can keep those grabbing, fading, delayed-effect drum brakes — give me a Plessey pump driven off the back of the gearbox (interrupting its flow of fluid is what activates the brakes), discs and pads any bend of the track. All I need now is some turn-in. Ah, understeer. Ifs straightforward to dial out, though (at this speed at least), and a joy to correct. You can keep those play-full steering boxes, too. This rack provides and processes info in an easily understood manner, then translates and transmits your input with equal clarity. It requires some ab and pec to initiate it and, I guess, a braced torso to dial in some opposite-lock at high speed, but oozes feline grace. This is lulling. Running arrow-true on a straight, it's fingertip stuff. At which point, I'm jolted out of it as I traverse my only significant bump at speed. The torsion bars do The Twist, the dampers go soggy and that lumbering rear axle comes alive. The D darts left then right --- or was it right then left? --- before realigning itself. Hmm, add another 50mph and 23 hours 40 minutes... 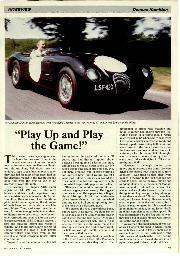 This car may have been the ideal tool for Le Mans, but winning in it there was no gimme, as 1954 proved. Jaguar's three-car team had by the midway point been whittled down to one which, with less than two hours to go, was running second when the rain intensified. Rolt dived into the pits to replace his misted-up goggles. He had not seen the lead Ferrari --- it was surrounded by mechanics, press and officials --- stationary at its pit The Jag was suddenly back on the lead lap and was waved straight back out But Rolt really couldn't see and stopped again. This time, however, with his co-driver Duncan Hamilton suited, booted and visor-ed for the conditions, the team effected a quick driver swap. Jaguar could have protested Ferrari's final stop due to a number of regulatory infractions, but it knew that this would have taken the gloss off a fantastic battle that had given new lustre to an event which some considered to be going stale. Instead, it was happy to wait, confident that the D -type's day would come. And so it did. 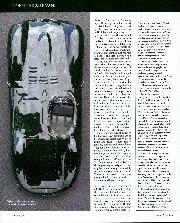 But what Jaguar could not have known was that the D -type's day would never go.